The Big Guy came home last week after an overnight shift clutching a large, suspiciously familiar box. It was an egg carton for a dozen and a half eggs (an odd size, admittedly, and not one I’m used to seeing). Apparently one of his coworkers brought in 6 dozen so that the team could make omelettes. The team is only 8 people and not everyone ate eggs. Which left a considerable amount of eggs with no home. And as said coworker actually raises the chickens that laid these eggs, he clearly didn’t want them back. Bless the Big Guy’s heart, he knew I would take them, even if I had no clue what I’d do with them right away. Of course, I’d just been to the farmer’s market and bought a dozen from the Amish vendor in the corner and I still had half a dozen in the fridge at home. 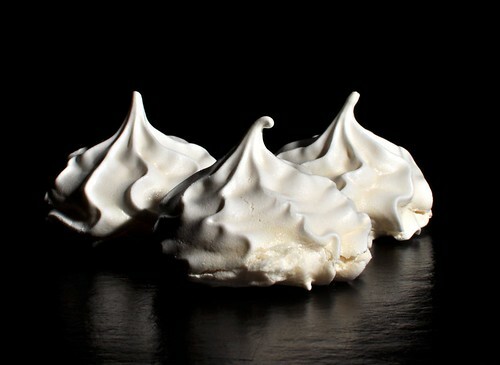 Homemade Meringue (courtesy of Anita Sarkessian on flickr). Preheat the oven to 200F and line two half-sheet baking sheets with parchment or baking paper. In an electric stand mixer with a whisk attachment, add the egg whites and salt. Beat them on medium speed until they’re a bit foamy (like boiling water you’ve caught in still-life), about two minutes. Turn up the mixer speed to medium-high and add 1/3 of the white sugar, then beat for two minutes. Add another 1/3 of the white sugar and beat again for two more minutes. Add the last 1/3 of the white sugar and continue beating the while mixture until stiff peaks form in the eggs (perhaps another two minutes longer at medium-high speed). Add the powdered sugar and the the lemon extract and beat only long enough for everything to mix very well, no longer than another minute or so. Don’t taste the batter at this point. Trust me (see the notes). Spoon everything into a pastry bag fitted with any fancy tip your heart desires or a zippered plastic bag if you’re a cheap little Dutch girl like I am (if you’re using the plastic bag, cut off about half an inch of one corner once you have the bag filled and shut). On the pre-lined baking sheets, pipe small 1″ rounds of egg whites about 1″ apart from each other. Notes I’m letting you know now that you’re taking your life into your own hands if you try this with more than three egg whites. You need a lot of oven space for this recipe and you can’t really set aside the egg whites that don’t fit while you’re waiting for the first batch to cook. You have to do it all at once. At most, I think I could double this recipe and still fit in my standard oven. More than this though and you’re bound to be disappointed. Most people will tell you not to taste the batter at this point because of the whole raw egg danger issue. While I’m aware of that potential problem, I know my farmers and I know my food. I’m still tasting the batter to see what it will turn out to be. In this case, it’s horrible. Don’t try it. You’ll think you’re eating lemon furniture polish even if you’re using the best, organic lemon extract money can buy. Vile. Absolutely vile. But my god they bake up so well. It’s possible to make these in a good food dehydrator if you either know the temperature of the unit or if you can control the temperature. I haven’t done it this way but I know people who have. They’ve told me that they’ve successfully placed parchment on the racks, poked small holes in the paper, then piped the meringues directly onto the trays. Two temperatures were given to me. One person mentioned 135F for 4 hours or until they’re hard and another person mentioned 115F for 8 hours or until hard. I’ve not yet done it this way so use caution, but let me know how it works out for you. It’s not that hard to make these cookies a couple of days in advance of when you need them. What makes them ideal for me though is that you can freeze them if you find yourself with extra egg whites that need using up. Simply make sure they’re protected in a container that can’t be crushed and aren’t overly crowded. They’re a great little treat to have on hand for unexpected guests too. You are currently reading Recipe: Lemon Meringue Cookies at More Than Just the Food.